The rural areas and arts seem to have become so close in Japan now. Art Camp Hakushu, the precursor of the regional art festival in Japan has been held in the mid of 1990s and then, the huge art festivals such as Echigo-Tsumari Art Triennial and The Setouchi Triennial began after 2000. The number of art festivals at rural areas have increased hugely. These art festivals are very large in number and even we cannot know what is happening at the all of art festivals. Furthermore, Tokyo Olympics in 2020 offer a big chance for the Japanese government to hold a nation-wide cultural program not only for the cultural Olympiad but as priming for tourism. That kind of tide can be a cheerful aspect because rural people who haven’t experienced the contemporary arts could have an opportunity to participate. Conversely, some say the controversial current situation between rural areas and the arts must be analysed. The sociologist Hudeyuki Sadakane mentioned the avant-garde artists who mobilized the Osaka International Expo in 1970 and their arts lack an aspect of criticism and rather acts as a catalyst for tourism. The same things happen at the current art festivals in Japan. They act as catalysts for tourism instead of as social criticism. We call that situation “consuming” arts. Now the arts are mobilized under the name of “energizing local areas”; have the arts lost their critical element, the alternative power and autonomy that they must have been essentially possessed? Also, are there new possibilities for art expression under the current situation? If so, what kind of arts are they? Tokyo Olympics 2020 is approaching and our community and society are forced to change. Now is the time we must analyze these issues. 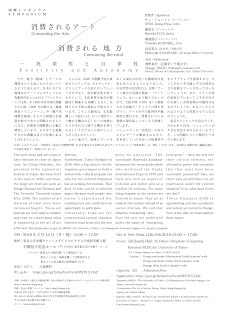 *We hold This Symposium as part of AMSEA （The University of Tokyo | Art Management of Socially Engaged Art）practice program .